Are there areas in your home you would like to be cooler or warmer but they have no ductwork or registers present? We can install a ductless mini-split system that places a self-contained air handler in the room to provide air conditioning. Ductless mini-splits are also available as heat pumps, which can provide both heating and cooling. You'll enjoy specialized, full power comfort all year long. These systems are efficient, quiet and operate unobtrusively within almost any room in your home. 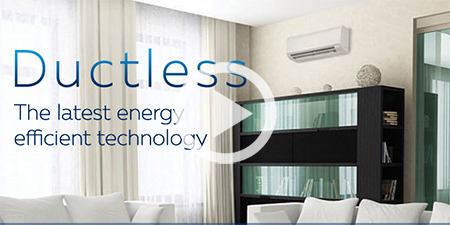 Mitsubishi Ductless air conditioning systems are flexible, no matter how complex your needs. Single zone systems are perfect for addressing comfort issues in a concentrated place in your home, such as hot and cold spots or rooms without preexisting ductwork. Ductless mini-split systems are made up of an indoor unit which can be mounted on the wall or ceiling. The small indoor unit connects to the outdoor unit. Multi-zone outdoor units connect multiple indoor units, providing individualized comfort control to different areas within the home (or office!) The system is operated by convenient remote control, both wireless and wall-mounted, programmable touch-screen thermostat controls and wireless. For zoned systems, you can control individual room temperature and only use energy where and when you need it! Total Comfort Mechanical is recognized by Mitsubishi as an Elite Diamond Contractor. This means our staff is certified by the manufacturer as experts in the installation and care of Mitsubishi® Ductless Heating and Cooling systems and products. We also have a vast selection of other brands of ductless air conditioning and heat pump systems that we are qualified to install and service. Packed with advanced technology, Mitsubishi systems feature a variable speed, inverter-driven compressor to maintain comfort along with a wide angle air spread for faster cooling. Inverter sensor units detect subtle changes in temperature and adjust the compressor speed automatically. The system adjusts itself to the level needed to maintain a consistently comfortable indoor environment. Inverter technology delivers only the energy needed to satisfy the cooling and heating load of a room, thereby reducing energy consumption! Models are available up to four ton capacities and can be grouped together to provide additional capacity with multiple configurations. Mitsubishi products installed by Total Comfort Mechanical have a 7-year parts and compressor warranty. Our NATE certified and manufacturer-trained technicians will ensure that your Mitsubishi Ductless Mini-Split system is working at its full potential to keep you comfortable and save your money. Installation is fast, easy and affordable. Let us match you with the ductless options that are right for you!